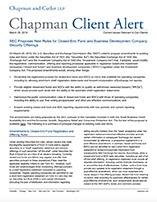 The 2019 update of Chapman’s book, “The Regulation of Marketplace Lending: A Summary of the Principal Issues,” addresses the latest true lender developments, the OCC charter for fintech companies, CFPB changes and how they may affect regulatory priorities and enforcement, the roles of banks in marketplace lending, and servicing and collection issues. 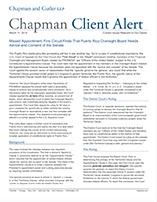 In a decision that upends the expectations of the municipal bond market, a three-judge panel of the U.S. Court of Appeals for the First Circuit has ruled that the “special revenue” provisions of the U.S. Bankruptcy Code do not compel the payment of debt service on certain municipal bonds during the pendency of a bankruptcy proceeding. On March 28, the Securities and Exchange Commission charged the former controller of the College of New Rochelle, a New York-based not-for-profit college, with violating, and aiding and abetting violations of, the antifraud provisions of the federal securities laws. Pension shortfalls. Crumbling infrastructure. Wage pressures. These are only a few of the budgetary pressures facing state and local governments. It’s no surprise that, with so many demands on limited tax dollars, funds needed to address social problems are being diverted. Fund sponsors are increasingly considering two similar types of registered closed-end investment companies known as “interval funds” and “tender offer funds” as an attractive alternative to open-end mutual funds, ETFs and traditional closed-end funds. On March 20, the Securities and Exchange Commission voted to propose amendments to existing rules and forms that, if adopted, would modify the registration, communication, offering and reporting processes applicable to registered closed-end investment companies and business development companies regulated under the Investment Company Act. In a break from other recent circuit court decisions, the Fifth Circuit ruled that amounts due under a make-whole provision contained in a note purchase agreement constituted unmatured interest and were not permitted to be paid to a creditor under the Bankruptcy Code. In a case of constitutional importance, the US Court of Appeals for the First Circuit addressed whether members of the Financial Oversight and Management Board created by PROMESA are “Officers of the United States” subject to the US Constitution’s Appointments Clause. Effective February 27, 2019, there are two new reportable events for which an issuer must provide notice to the Municipal Securities Rulemaking Board’s Electronic Municipal Market Access (EMMA) website. The US Court of Appeals for the Ninth Circuit is the latest court in a developing line of case law to find that the doctrine of equitable mootness applies to prevent an aggrieved creditor from unwinding a substantially consummated Chapter 9 municipal bankruptcy plan. 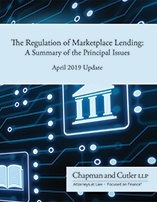 The 2019 update of Chapman's book, "The Regulation of Marketplace Lending: A Summary of the Principal Issues," discusses the latest true lender developments, the OCC charter for fintech companies, CFPB changes and how they may affect regulatory priorities and enforcement, the roles of banks in marketplace lending, and servicing and collection issues. 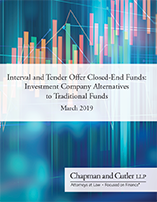 Chapman's "Interval and Tender Offer Closed-End Funds: Investment Company Alternatives to Traditional Funds" provides a summary of the interval fund and tender offer fund structures, including their basic legal framework, their investment restrictions, how they are distributed and how they facilitate redemptions, as well as a comparison of interval funds and tender offer funds. 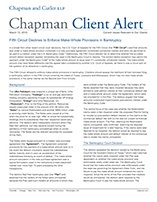 The 2018 update to Chapman's “Bankruptcy Desk Reference for Equipment Lenders and Lessors” provides an in-depth analysis of the issues affecting an equipment lessor when dealing with a lessee after it has filed for bankruptcy protection, as well as certain problems that can be avoided when initially drafting and entering into a lease agreement. Chapman’s "Defaulted Securities: The Guide for Trustees and Bondholders" advances understanding and consideration of issues related to trustees and bondholders in corporate and municipal financings. The book is now available on Amazon.com. 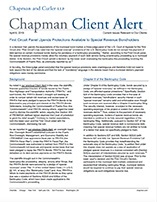 Chapman's updated desk reference, "Post-Financial Crisis Statutory and Regulatory Initiatives Affecting ABCP Conduits," provides a comprehensive guide for how Dodd-Frank and other post-financial crisis regulatory developments affect asset-backed commercial paper conduits and their sponsors. 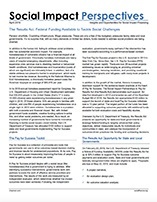 Chapman's white paper, "Inroads to Innovation: State Adoption of Pay for Success Legislation," addresses legislation that has been adopted at the state level, pointing out the various functions of the pay for success financing structure and how states have treated these components within their legislation. The second edition of Chapman’s book, "Municipalities in Distress? How States and Investors Deal with Local Government Financial Emergencies," is now available on Amazon.com. 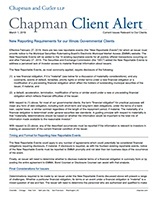 Chapman's publication, "The ABI Commission on Reform of Chapter 11 Final Report," is a compilation of our client alerts published regarding the Final Report and Recommendations released by the American Bankruptcy Institute Commission to Study the Reform of Chapter 11. The attached compendium contains in-depth analysis of certain key provisions that are most likely to significantly affect the rights of secured creditors. 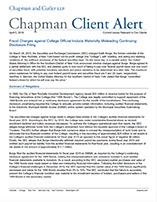 Chapman's white paper, "Securities Law Considerations for Higher Education Bonds," offers institutions of higher education a summary and practical guide to the principal requirements of federal securities laws relating to municipal bonds. Chapman's "Presentation Catalog" is a sampling of presentations that Chapman attorneys can provide for business and legal teams. Our presentations can be tailored for business-related purposes or to earn Continuing Legal Eduction (CLE) credit. Download the catalog. 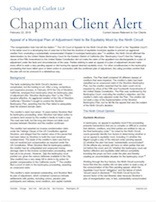 Chapman’s "Defaulted Securities: The Guide for Trustees and Bondholders" advances understanding and consideration of issues related to trustees and bondholders in both corporate and municipal financings. In a decision that deals a potential blow to holdout noteholders in out-of-court restructurings, the United States Court of Appeals for the Second Circuit adopted a narrow interpretation of Section 316(b) of the Trust Indenture Act. Retail bondholders recently filed two class action suits in the United States District Court for the Southern District of New York challenging exchange offers under the Trust Indenture Act. A recent decision in the Southern District of New York interpreting the Trust Indenture Act will likely provide bondholders additional leverage in out-of-court restructurings. Out-of-court debt restructurings may face greater hurdles to success in light of two recent federal court decisions out of New York broadly expanding dissenting bondholders’ rights under the Trust Indenture Act.